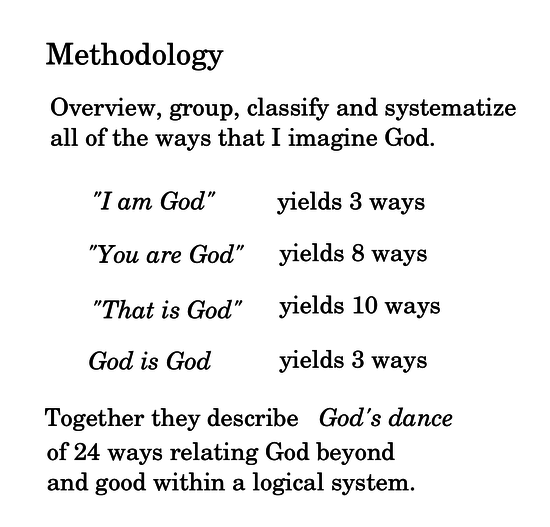 I present a conceptual framework, God's Dance, which expresses the extent of my own imagination, as to what unfolds when I imagine God's point of view. God's Dance is what unfolds when God asks himself: Is God necessary? Such a framework is helpful because it outlines what my imagination, or perhaps any human imagination, inherently supposes upon imagining God's vantage point. I wish to know everything and apply that knowledge usefully, and so God's vantage point is very relevant, whether or not God himself is real. Indeed, such a vantage point is fundamental if we are to have absolute truth, an understanding of what any logic assumes, or simply a big picture of life. I find it helpful to identify God with a state of contradiction, where all statements are true, as we know from mathematics. 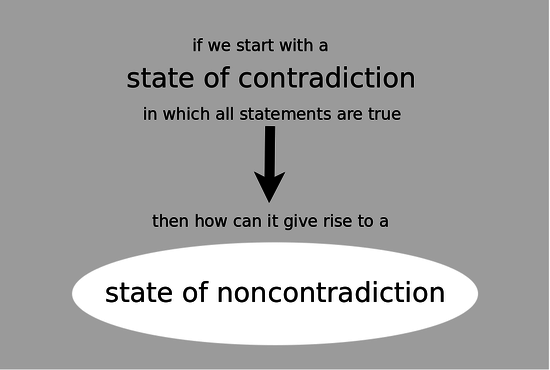 We can then wonder, how can God give rise to a state of noncontradiction? My method is to survey and systematize all of the ways that I sincerely imagine God. As I sorted through the ways, I noted that they differ in the pronoun by which we refer to God. 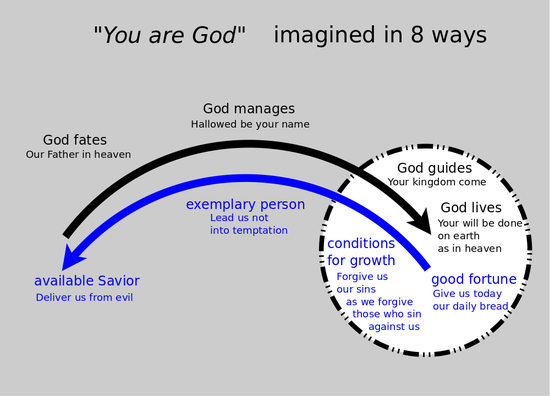 In 8 ways, I imagine God as the second person, "You are God". In 10 ways, I imagine God in the third person, "That is God". In 3 ways, I imagine that God lives through me. God is God. Let us imagine God all alone, prior to all things, including logic, time, world, thought, being, meaning and love. Such a God might say, "I am God", although such a God has yet to speak, and for such a God being and non-being are all the same, as they are just words. If I think as simply as possible, at the heart of whatever I imagine, with so little defined, I imagine only one issue which might move God. 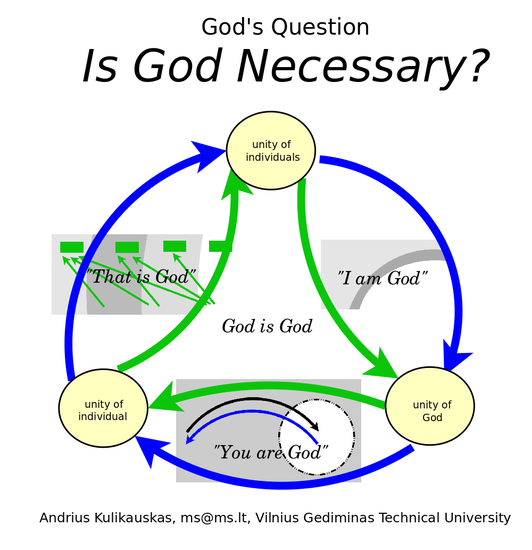 God asks himself, Is God necessary? Would I be even if I was not? 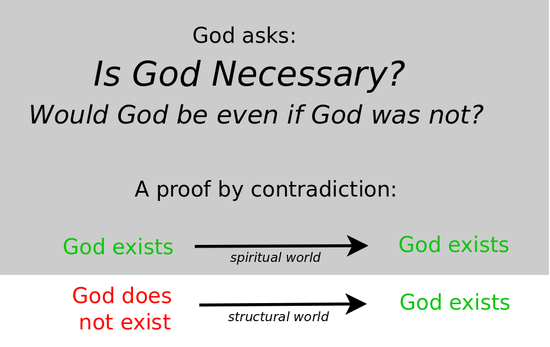 And so God proceeds as in a proof by contradiction. If God exists, then God exists. This is what we suppose in the spiritual world. But suppose God did not exist. Even so, ultimately, God should exist. This describes the physical world, or more broadly, the structural world, whatever is void of spirit. God makes way for his nonexistence and considers what will happen. God thus makes way for the least favorable situation for his existence, which we can think of as our own world, and even, our own lives. Even here, surely God will arise, as I believe is the case with Jesus, although for the purpose of God's exploration it could be, indeed, should be, any of us. At the heart of each of us, then, is a Godling, a drop of God, a shard of God, a child of God. And so there is God who understands and God who comes to understand, who figures out that he is God. But how do they know that they are the same God? It is because they understand the same thing, the same God. We can think of the latter as a lens by which the Godling is equal to the original God. That equality is inherent in the Godling's incredible naivety, when it insists that God be good, and indeed, by its insistence, makes God so. Thus we have God who understands, God who comes to understand, and God who is understood. This says less about God and more about how our imagination variously approaches God. It makes sense of the Holy Trinity - Father, Son and Spirit - without relying on faith or requiring any mystery. 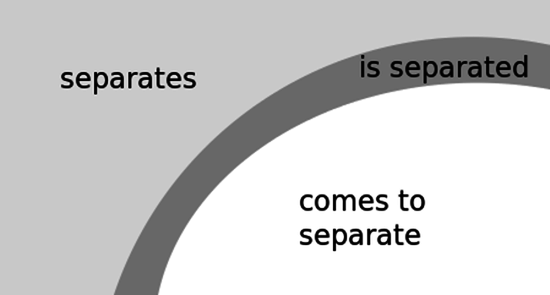 Cognitively, to understand is to separate out. Thus we have God who separates, God who thereby comes to separate, and the same God who is thereby separated. We have three different perspectives as to the same God. We thus imagine God in terms of three pronouns: first person "I", second person "You" and third person "That". We imagine the God who understands as experiencing "I am God". 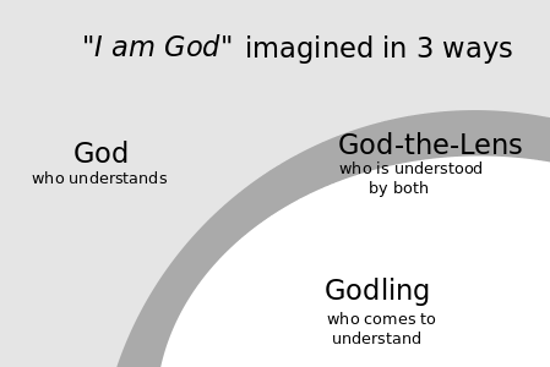 We imagine the Godling as testifying "You are God". And we imagine God-the-Lens as asserting from the side, "That is God". We have described three perspectives by which God considers whether God is necessary. But this is how it appears for God who understands. Let us now consider the same question from the perspective of God who comes to understand, for whom God is "You". This yields an additional eight ways of imagining God. Imagine God who comes to understand they are God. Then this understanding comes after God has removed himself and comes with God reappearing. And so from this vantage point, in our imagination, we do not experience this as an unfolding process but rather as a fulfilling process. 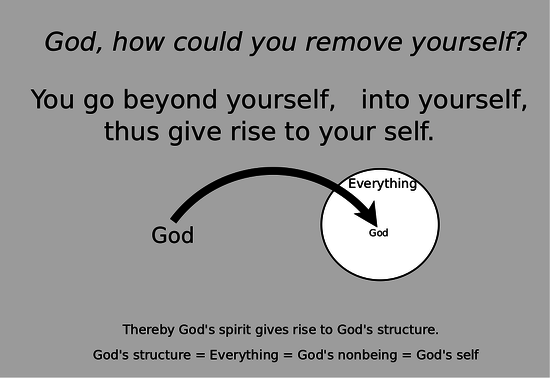 For God to remove himself, he must go beyond himself. But he is yet to have a self, and so this self arises as he goes beyond himself. And he has nowhere to go except into himself. Thus he goes beyond himself, into himself and thus gives rise to himself. We may think of God as spirit or activity for which God's self is God's structure, Everything. God's self is God's nonbeing, which closely matches God, reflects God, complements Gods, as a glove matches a hand. God thus finds himself within a system, within conditions. And God within conditions is goodness. With all of this in mind, we imagine God's going beyond himself in terms of four distinct states: God beyond conditions, God making way for conditions, God entering conditions, and God within conditions. This highly abstract thinking manifests itself concretely in two very different ways. 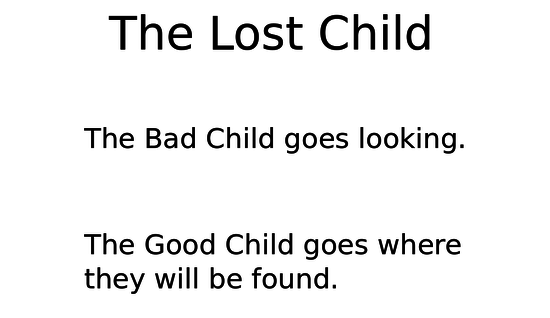 Consider a lost child. A foolish child will look for her parents, which can make things much worse. Whereas a wise child will realize, "I am the child; they are the parent; they should be looking for me; I will go where they will most easily find me." The latter child is thus able to coordinate with her parent without any communication. It is enough that she is able to appreciate her own conditionality, unlike the foolish child, and to imagine a vantage point beyond. We can recall Jesus, the lost twelve year old, who told his parents, Did you not know that I had to be in my Father's house? In the Gospels, we can discern a conflict between the Son's and the Father's point of view, where they favor the good child and the bad child, respectively. The Son's vision is given by his Sermon on the Mount, whereby the good children establish through their moral behavior a "kingdom of heaven", where what we believe is what happens, where God is welcome on this earth, and everybody is swayed to join in. The Father's vision is to let us, sinners, hate the Son for being good, make an example of him, realize the evil we have done, repent and be saved. Thus "God so loved the world that he gave his only begotten Son...", but at the Last Supper, the Son tells the Father, "I don't pray for the world, I pray for my own." And yet, the Son defers, "Not my will, but yours." We thus have one narrative, that of the "good child", who wonders, "Am I God? ", and comes to realize, "Yes, I am God, in that God lives through me, in that I am good." As the good child, we imagine a God beyond our conditions, a God who will find us within them. Such a God fates and knows all things. We can then imagine this God opening up our conditions, and managing them, responding to developments, rewarding us and punishing us, that we may grow alive. As we grow in freedom, we can further imagine a God who guides us, who acts within our conditions to inspire us to make the most of them. We realize that God does not have to be good, life does not have to be fair, but we ourselves can be good. Finally, God lives through us when we participate in cultivating a shared culture, the Kingdom of heaven, where what each of us believes is what happens. 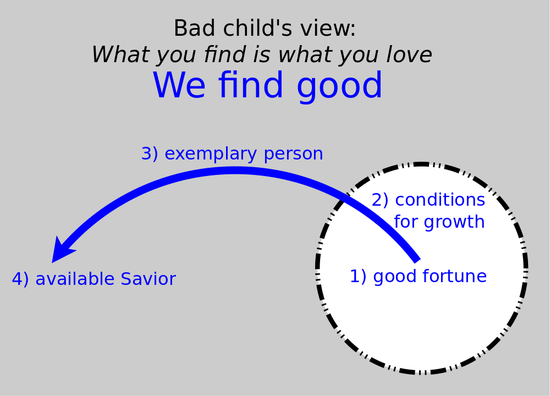 Another narrative familiar to us is that of the "bad child", who wonders, "Am I good? ", and comes to realize, "No, I am not good, for I need God, who is greater than me." As the bad child, we do not conceive of anything beyond our conditions, and thus do not distinguish between God and goodness. From this point of view, we discover goodness and it leads us to think more broadly. First, we notice our good fortune, instances of undeserved grace, which suggest that good has a source. Further, there are times when we grow as individuals, and such moments depend on a person's or God's love for us, which acknowledges us for who we are and who we could be, which we can accept as our mould, and thus let go of our old self and take up a new self. Next, there is the standard of an all-around perfect person who I may always choose to live as, and who I can ever compare myself to and openly inform. Finally, in realizing that I am absolutely corrupt in ways that I myself cannot correct, I fully submit to a God whose wisdom and providence is incomparably greater than mine, and who is good enough to overcome any evil. We thus live by two narratives. As the bad child, we crave goodness, which means that we impose our conditions upon God, and we come to learn that God is greater. As the good child, we appreciate that God is greater than our conditions, and we accept the terms by which God enters our lives: God does not have to be good; life does not have to be fair; and yet we can ourselves be good so that God lives through us. 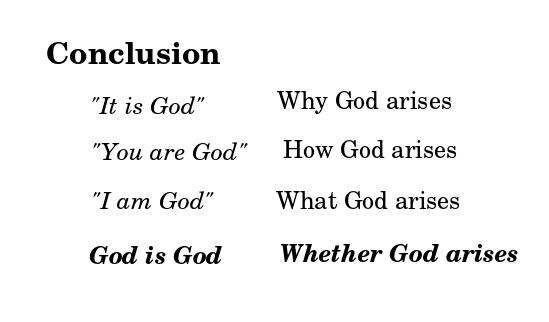 These two narratives define an eightfold structure by which we imagine, "You are God". I think it is inherent in the prayer "Our Father" which Jesus taught for engaging God. Other eightfold structures which I think leverage this framework are The Beatitudes, St.Peter's Keys to Heaven (2 Pt 1:5-7), Buddha's eightfold way, and even the axioms of Zermelo-Fraenkel set theory and the major chords of the musical octave. I have found this structure most evident in my study of the variety of mistakes that we make. In serving others, we may err in our empathy for them, in our expectations for them, in our principle which we apply, and in our judgement by which we apply it. But here in each case we live openly, publicly, one with others, along with God who goes beyond himself: God of God, God of I, God of You and God of All. And so we make mistakes but we do not sin for we are not acting from our own interest. Yet internally we may also have our own private goal - a conditional goodness - which may indirectly serve all, but may also lead us astray. We can err in our goal, in our effort to achieve that goal, in our will to apply our effort, and in our conscience that our goal may be conditional, but our effort must not be. Thus, in climbing out of our conditions, we must admit of a God beyond conditions. Life is the fact that God is good, but eternal life is understanding that God does not have to be good, life does not have to be fair. We must not insist to be the measure of it, but be ready to let go of ourselves. Thus the good child variously imagines God, whereas the bad child imagines goodness. 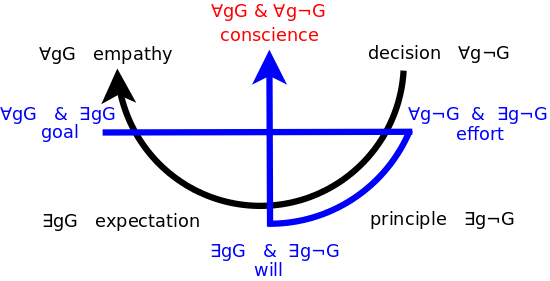 From a logical point of view, their positions come together in eight possibilities of a logical square, as to whether godlings are God or not. 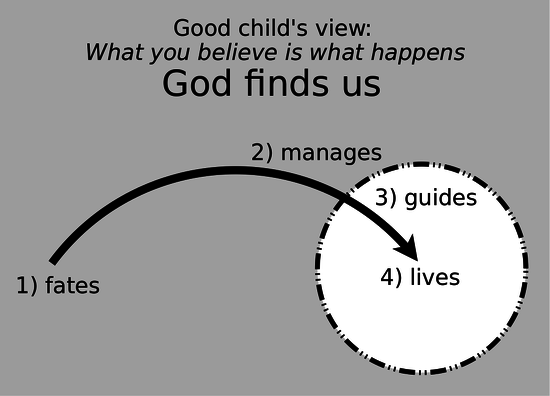 The good child imagines how God enters the world, and thus runs through the logical possibilities: originally, all godlings are not God (for God's original decision is beyond us); and, in particular, there is a godling which is not God (for I am not perfect, and as a principle, less than God); and yet there is a godling which is God (in that I expect God and life to treat me unfairly); and indeed all godlings are God (working towards a shared culture of empathy). Thus the good child asserts himself by serving God and then living as God. The bad child discovers how goodness is rooted beyond this world. First, goodness (as a goal) is a grace manifestly present everywhere. And yet goodness (as an effort) depends on our growth, and so is manifestly ever lacking. Thus goodness (as a will) is a manifest choice to be made by an ideal person within us. Finally, goodness (as a conscience) is the fact that we must ultimately give up ourselves to God before whom all collapses, good and bad. Thus in serving ourselves we are led to give up ourselves, for we as such, without God, are conditional. We have considered from God's perspective what it means for God to investigate, Is God necessary? This yielded three ways of imagining "I am God". We further imagined how this investigation appears from the point of view of God who arises, yielding eight ways of imagining "You are God". Finally, we consider how this looks from the side, as if objectively, from the point of view of God who acts as a lens. This will yield ten ways of imagining "That is God". Imagining God's investigation, his retreat and rearisal, as if from the side, we observe his creation of suitable conditions, namely, his love. God himself creates conditions for God to arise. He likewise, in arising, works in tandem with God to create conditions for each other to arise. As a lens, he creates conditions for all to arise. Thus, variously, to the same effect, God loves himself, loves each other and loves all. Viewed from the side, God's going beyond himself can be considered, as a unity that holds across different stages, different conditions, as experienced by God who understands, beyond conditions. God prior to conditions is God, and God within conditions is goodness. Life is the fact that God is good, which is the case when God is entering conditions, entering his self. But eternal life is understanding that God does not have to be good, which is the case when God is creating conditions, creating his self. But a God within conditions, who comes to understand, experiences distinct stages individually. Such a God experiences themselves, within conditions, as "I", and experiences "God" as beyond themselves, beyond conditions. 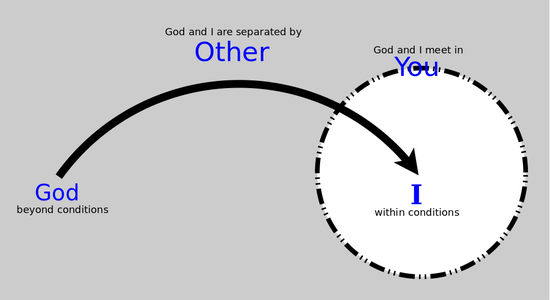 "God" and "I" meet in "You", by which God enters our conditions. "God" and "I" are separated by "Other", who falls outside of our conditions. These various persons manifest the separation between God beyond us, who understands, and God within us, who comes to understand. God as "I" must arise for God loves himself. 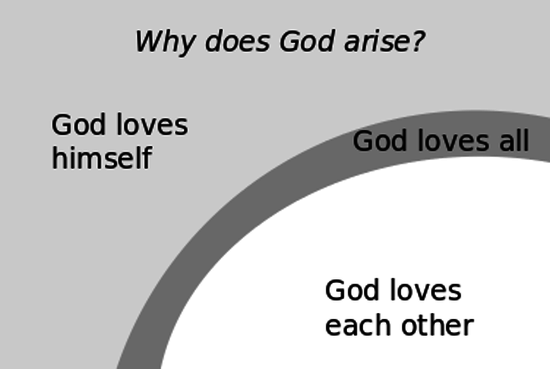 More problematically, God as "You" must arise for indeed God loves each other. But God as "Other" refers to the God beyond conditions who God, arising in conditions, has yet to engage. Eternally unfolding is this open question of whether, in each of our lives, there is God as "Other", an objectivity, an absolute truth, through whom we all are. Does God love all? This is a question of unity: the unity of God, the unity of all, and in each individual, the unity of these two unities. If we are united unconditionally, then we let go of ourselves and are united through God, as when we love unconditionally. If we take ourselves as given, and we love each other as such, then we may all be united conditionally, but we let go of unconditionality - we let go of God. We have selves - we have conditions - but God is beyond our selves. Yet God is in unity with us in our conditions. We know our conditions, whereas God beyond conditions does not know, but wishes to know. God wishes our conditions upon himself and is thus united beyond and within our conditions. God wishes for nothing, is self-sufficient, whereas we have a body with needs. This is the primordial God who is prior to being, logic, time, space, love, meaning, self and all persons and things. God wishes for something, is certain, whereas we have a mind with doubts. This is divine attention that investigates and creates. God wishes for anything, is calm, whereas we have a heart with expectations. This is God who lurks in ambiguity, in possibility, both within our world and beyond it. 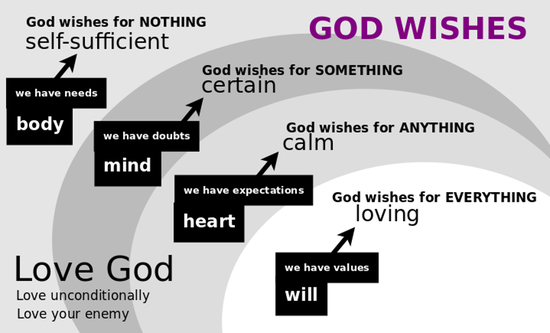 God wishes for everything, is loving, whereas we have a will with values. This is the good heart which we hope to testify is in the depths of each of us, which we make way for by showing good will. Indeed God, like a parent, wishes for all of our nonsensical concerns, wants us to be alive, sensitive and responsive, more than we ourselves do, whereas we have values that unite each of us in what we know, namely, our conditions. We love God by loving unconditionally, by loving with all of our body, mind, heart and will. We love God by loving our enemy, for we hate our enemy and can only love them by letting go of our own conditional view and taking up God's unconditional view. We have only one God, who is self-sufficient. We have only one icon for God, his name of certainty: "I am who I am". We have only one index for God, his activity of peace, our day of rest. We have only one symbol for God, our parents who love us more than we love ourselves, who we respect. These are our signs of whether, what, how and why God is. In voluntarily keeping these four positive commandments, we establish God as unconditional unity, we love God. We embrace this unity if we let go of our own conditions so that we can share in God's unconditionality. We love all beyond conditions. However, we may also embrace our own conditions. Then God is beyond us, unconditional. We are all dispersed in our conditions, and yet we are united in the truth of God that is revealed in our conditions. 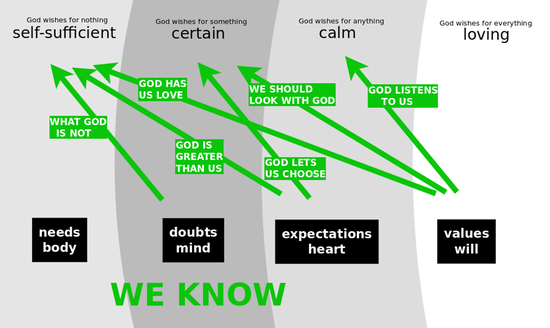 We variously know God. We have minds with doubts, whereas God is self-sufficient. Thus we know what God is not. God is more than what we can imagine: not bounded, not finite, etc..
We have hearts with expectations, whereas God is self-sufficient. Thus we know that God is greater than us. We appreciate this when we engage God as an equal, for we exhaust ourselves but God does not exhaust himself. 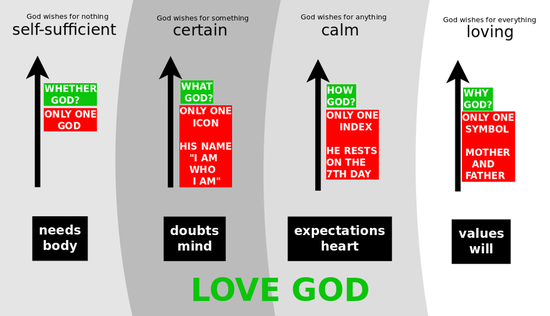 We have hearts with expectations, whereas God is certain. Thus we know that God lets us choose. God gives us the freedom to find our own way into the unknown. We have wills with values, whereas God is calm. Thus we know that God listens to us. God, as a seeker of truth, listens for our testimony. We have wills with values, whereas God is certain. Thus we know that we should look with God rather than at God. 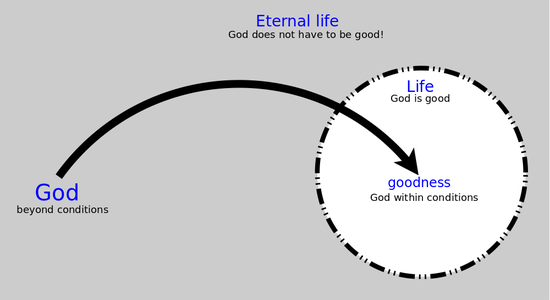 For to look at God is to choose life, God's goodness, but also death, which is what is left of us upon unraveling life. But to look with God is to choose eternal life, to understand that God doesn't have to be good, life doesn't have to be fair, to investigate along with God, to have God live through us, to forever grow alive, sensitive and responsive. We have wills with values, whereas God is self-sufficient. Thus we know that God has us love. God enables us to love a person with all of our body, mind, heart and will, so that we are completely focused to serve them and all. In all these ways, we know what we do not know. We know God by noting the gap between our conditionality with his unconditionality. Given our attachment to our conditions, we cannot love our unconditional God directly, but rather we can love all who are in our conditions, and thus love not ourselves but our conditions. We love our neighbors as ourselves: We love our friends, those who love us. We love those who are in conditions by respecting what we don't know, namely, the unconditional God in them. We must treat them as God's expression by which we know God. We must not kill, for we know what God is not. We cannot kill God and we should not kill a person, for God is beyond all we can know, within their very depths. We must not steal, for God is greater than us. We cannot steal from God, and we should not steal from people. We should take from what God gives us. We must not adulter, for God lets us choose. We cannot rescind God's grant, and we must respect people's wholehearted decisions. We should not lie, for God listens to us. We cannot fool God, and we should not fool ourselves and others. We should not covet things, for God does not look at things. We should look with God beyond anyone's things. 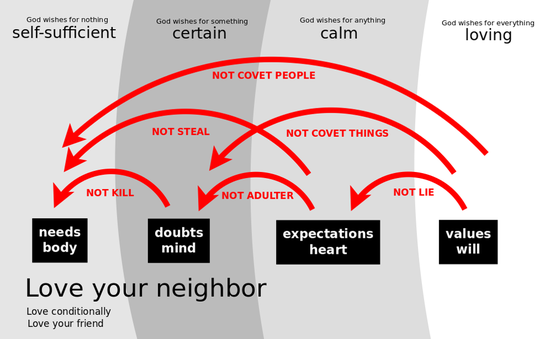 We should not covet people, for God has us love wholeheartedly. We should leave to all to love those who are given for them to love. In summary, we should not kill a person because we must acknowledge the unknown in the depths of their heart; we should not steal nor adulter because we cannot overwhelm God and he does not overwhelm us; we should not lie nor covet others' things nor people for we are all created by God to testify to him what we take to be absolutely important. In keeping the six negative commandments, we establish goodness as conditional unity by which we are all one, disparate though we are. Indeed, it is by being good, by keeping these commandments, by establishing our unity even in conditions, that we insist that God himself be good, that he be one with us in our conditions. We thus, as God, impose upon God that he be good, as we insist and aspire. This is what makes God good. Thus we love all, whether beyond conditions, through four positive commandments to love God, or within conditions, through six negative commandments to love others as ourselves. In both ways, we freely participate in God's arisal amongst all of us. 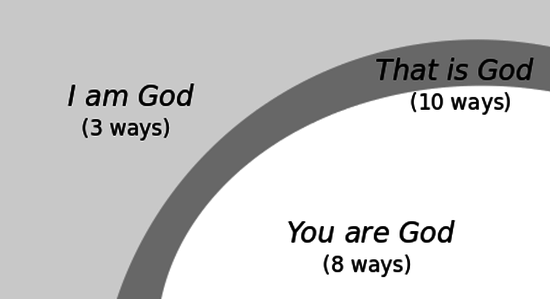 Thus I variously imagine God's perspective: "I am God" in 3 ways, "You are God" in 8 ways, and "That is God" in 10 ways. But how are these all the same God? These come together in three ways that I experience God directly. These are unities by which I live as God, one with God. When I am absolutely alone, heartbroken, then I may imagine, alongside me, God who is likewise all alone, and understand him, my kinship with him, and his deepest value - love - as the multidimensional integration of all of our deepest values. This is the unity of God. I may choose to live not as my self, my personality, what makes me different, but as the good person who does what any good person would do. With this outlook I regain all of my personal talents and possibilities. This is the unity of an individual. As a group of individuals, we may alternate in stepping-in (sharing our personal view) and stepping-out (observing the group dynamics) so that a holy spirit flutters amongst us. This is the unity of individuals. In life, when I take a stand, follow through, in reflect, then I live these three unities and unite them, as we all do. I take a stand as if I was all alone; I follow through as a person-in-general; and I reflect as through a spirit of community. In each mode, my conditional stance, stepped-in within me, is matched by God's unconditional stance, stepped-out beyond me. 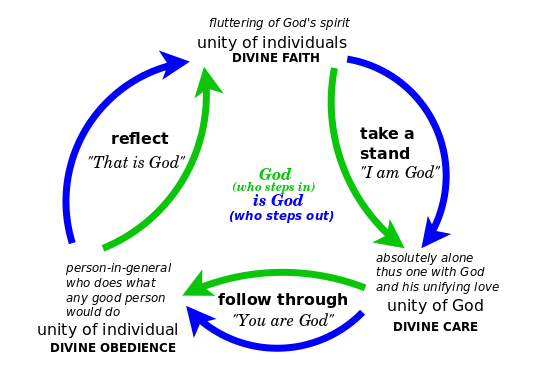 I move through this cycle of taking a stand, following through, and reflecting, by way of the frameworks discussed above for imagining "I am God", "You are God" and "That is God". Each of these frameworks distinguishes God beyond me, who understands, and God within me, who comes to understand. I reflect, but do I take a stand? This question motivates God who understands: "I am God". I take a stand, but do I follow through? This question motivates God who comes to understand: "You are God". I follow through, but do I reflect? This question motivates God who is understood by both: "That is God". Thus as we engage our lives - taking a stand, following through, and reflecting - we unite God in each view, and we unite all three views as well. But we are the most unfavorable circumstances for God. God thus necessarily arises. 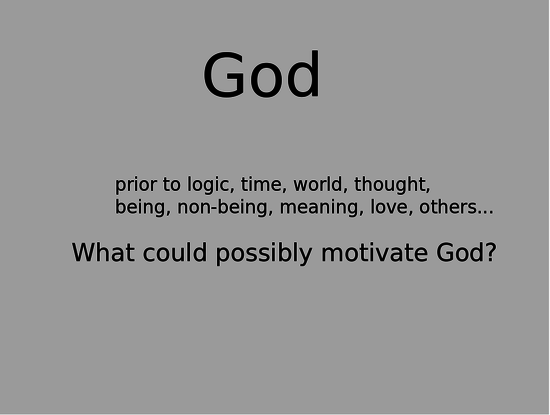 God is necessarily God. Is God necessary? The positive answer is manifest in our participation in life, taking a stand, following through, reflecting and then taking a stand anew. Thereby God is God, in other words, God is indeed the one who arises in God's conditions, which is to say, unconditionally arises in any conditions. why God arises (because we love all, unconditionally and conditionally, and thus God lives through us, through our endless growth - "That is God"). Our imagination of what God arises, how God arises and why God arises establishes us as the framework for whether God arises. I have sketched God's dance by studying my own imagination. However, if God wants me to know everything, in what form might that knowledge be available to me? It seems reasonable that it be something I can imagine, and most fundamentally, that it match the very limits of my imagination itself. And so, pragmatically, to the extent that there is a God, one who is not cruel, then this investigation yields true knowledge. But regardless of the actual nature of God, it documents and models the kind of God that, by my nature, is inherent in my imagination. Thank you to Thomas Gajdosik for ten or so long conversations in which he patiently and supportively listened as I tried to work this all out.